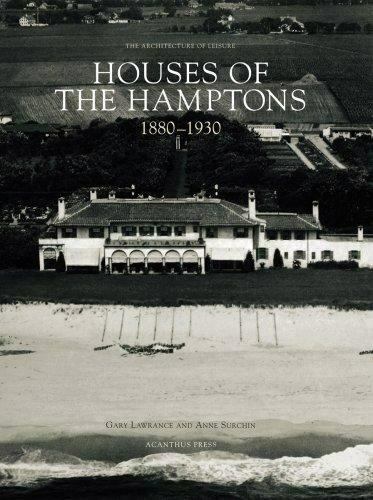 The Architecture of Leisure: Houses of the Hamptons, 1880-1930 by Gary Lawrance. Condition is Like New. Shipped with USPS Media Mail. What began as a tiny cluster of settlements established by Puritans fleeing the more restrictive towns to the north had evolved by the late 19th century into one of American's premier resort communities. The Hamptons, valued for their bracing air, their exceptional views, and their fertile soil, drew dozens of the best families in New York and New England society, who made the area their summer playground. As one society matron remarked of Southampton, Southampton is a little backwater of God. In this remarkable volume, filled with archival photographs, authors Gary Lawrance and Anne Surchin plunge the reader into this world of leisured, cultured existence. Their survey of more than 30 houses shows us treasures such as Ballyshear, Ocean Castle, The Bouwerie, and Port of Missing Men. They discuss the great architects of the period who designed these houses, including figures and firms such as Cross & Cross, John Russell Pope, and Leroy P. Ward. Among those for whom they designed houses in the Hamptons were Henry Francis du Pont, Col. Henry Huttleston Rogers, and Ellery James. Houses of the Hamptons offers a fascinating glimpse into the privileged society of the turn of the century, one that has all but vanished from the modern world.